← Design Culture Salon 12: Is innovation overrated and what is the role of design here? A select group gathered in Clore 55 for this pre-Christmas discussion in which we buried innovation with a stake through it and then resurrected it in partial glory. If ever there was a perfectly shaped, end-to-end debate, then this was it. Opening play, I tore into the possible circularity of the dominant, economic arguments for innovation. ‘We live in turbulent times, and so we have to innovate to stay ahead’ we are told. But where does this tubulence come from? Okay, we could name climate change, the rise in commodity prices or the increasing economic weight of BRIC countries. But we might also add in a vigorous, ideological adherence to a belief in innovation itself as something that is constantly destabilizing markets and social life. Noting the way that so much policy was being reframed under ‘innovation’ (e.g. the Technology Strategy Board being re-named as InnovateUK), it was asked whether innovation itself has reached the ‘peak of inflated expectations’? (This is taken from the so-called Hype Cycle that describes a common pattern to expectations regarding new technologies.) How far have we actually come from the 2005 Cox Review of Creativity in Business? Jamie Brassett responded by arguing for a re-framing of innovation. First, he noted that understandings of innovation were largely configured around a ‘for economic growth’ discourse and that there is little critical opposition to this notion. Second, ‘innovation’ is really about the promotion of sciences over other fields where it might be equally important. Third, and leading on from this, he invoked Joseph Schumpeter’s 1911 discussion of innovation expounded in his Theory of Economic Development; here, Schumpeter included social and cultural change within his definition of innovation, something which the drive around economic growth has left behind. Lucy Kimbell mapped out three current and prominent scenarios for innovation. These were: financial innovation where attempts are made to create new systems and arrangements for flows of capital; innovation in government and public policy making; and innovation in energy production and conservation in the context of climate change. Focusing more on the second of these, Lucy gave an outline of the Cabinet Office Policy Lab that she is working with as an AHRC Research Fellow. She drew attention to how, by including ethnographic approaches or creating ‘personas’, policy-makers are innovating their processes. In this they are thinking about the socio-material arrangements within which policy is bound up. At the same time, it is also recognizing the constantly performing provisionality of policy – that is, it is never finished. Duncan Fairfax picked up on this idea of the performance of innovation. He argued that innovation is ‘over-rated’, meaning that it is subject to performance analysis techniques and, indeed, is framed by these. In other words, innovations are only innovations when they are recognized as such and it takes systems of measurement to do this recognizing. Practices that are outside understood systems of measurement cannot enter into the frame of innovation, therefore. Innovation becomes a performative practice, done in order to satisfy pre-ordained targets or requirements. Invoking Derrida, Duncan argued that it is impossible to get out of this; invention is always within the known space of actualization. This leads us to think outside the box (ha! ha!) and to ask what innovation could be? Design thinking seems to sometimes get reduced to an algorithm, a set of abstracted procedures that conform to known structures and outcomes. What else is there? How, for example, can we get beyond the false construction of ‘user needs’ where users are positioned as ‘needy’ and in some form of poverty? At this point there was talk with reference to Jean-Francois Lyotard’s 1974 text The Libidinal Economy. I’ve always taken Lyotard to be wrapped up in all that Postmodern stuff around unending, superficial, jouissance-inflected sets of glances and exchanges. Certainly the libidinal economy is about an intensive drive to get out there and do your thing, regardless of the consequences. However, it seemed that, in contradistinction to the narrative around innovation that had been gathering through the evening, the libidinal economy at least offered a place to exercise our desires outside the strictures of audit culture. And if our desires are, in fact, social justice, sustainable living or democratic participation (as opposed to ‘growth’ or consumer culture), then we might be going somewhere else. This is where we moved to a more optimistic and less-restrained view on innovation. Things were looking up. Within this Lucy Kimbell made reference here to Geoff Mulgan’s take on social innovation in which scaling is a key factor. Thus there is the sense of continual prototyping and developing wherein scaling itself involves new forms and processes. At the same time, I asked, can we talk also about scaling down to produce more precision, intimacy and stewardship? Drawing on Gilles Deleuze (who else with Jamie Brassett in the room who is about to publish a book on Deleuze and design?) we discussed the proposal that acts of creativity should open up spaces for the creativity of others. There may be other ways of allowing this to happen by, for instance, deliberately not innovating or not designing. Preservation might be a radical act. Equally, managed decline might be a more human and more sensible approach to problems sometimes. Duncan Fairfax, on a final counter-attack that expanded on a brilliant intervention from an audience participant, added that ‘provisional performativity’ is where we might be going and where there is a sense of on-going prototyping and experimentation. This dumbfounds accepted notions of innovation as an end. The outcomes of innovation might not necessarily be preordained or formed around received systems of measurement and evaluation. Thus, he slotted the final goal into the back of the net with two moves: let’s imagine innovations that can be efficiently destroyed and/or produce ones that can be turned into something else. This represents a fundamental challenge to our current modes of cognition and intention. This entry was posted in innovation, publics, social innovation. Bookmark the permalink. 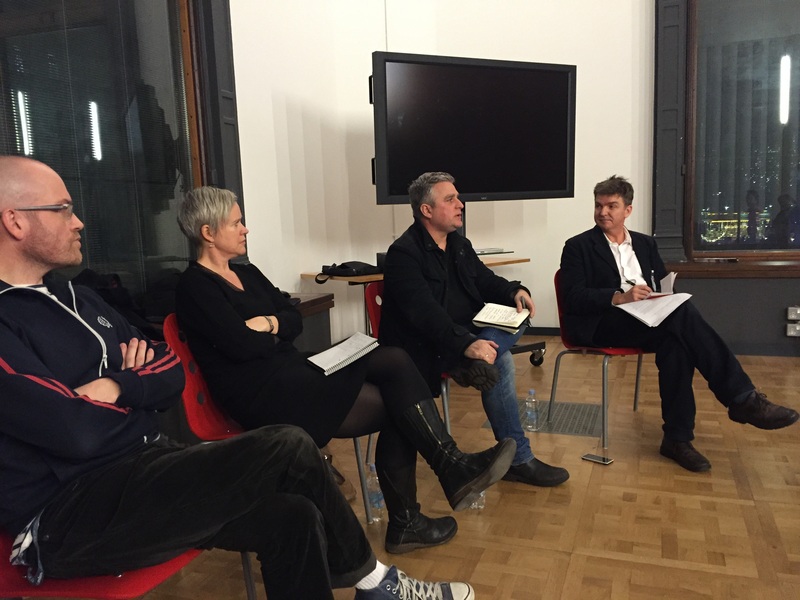 1 Response to Reflections on Design Culture Salon 12: Is innovation overrated and what is the role of design here? Interesting discussion from the Design Culture Salon. A subtle critique to Innovation-management and design thinking as its creative slave!